Many high powered employees wonder if a labor lawyer is the right lawyer to represent them if they have an employment issue. Although the term labor often refers to non-management and nonexempt employees in unions, the same type of attorney who represents labor may be qualified to represent management. Firm founder, Karl Gerber, is just the sort of lawyer an executive would want to be represented by. He has been representing employees since 1993. His legal skills include actual trial experience, published appeals, over 300 legal articles, serious pre-trial litigation, large settlements, verdicts, and arbitration awards. 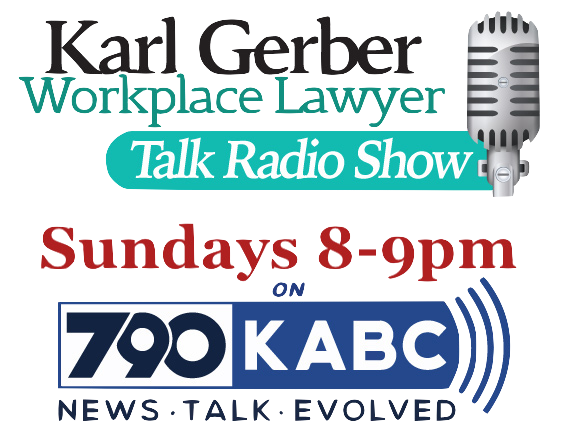 While a younger, or small time attorney might not be the right lawyer to represent a high wage earning executive, Karl Gerber would be. At our firm he is involved in all litigation strategies and management of our employee lawyers. If you need proper legal representation for a big fight against your employer, or you would prefer diplomatic and discrete legal representation we can assist you. Age discrimination and disability discrimination can also be problems for executive level employees. So much is expected out of high level employees. Many employers assume employees will no longer be able to perform if they are experiencing medical problems such as cancer, pregnancy, or they suffer from a disability. Because executives are often older, a time comes when they are excised from their employment due to age. Although executives may have a history of high earnings, we do not expect a former executive level employee to hire our firm and pay us by the hour. Quite frankly, the employee ends up saving considerable money by hiring a lawyer on a contingency. While Karl Gerber’s regular hourly rate is $475.00 an hour or more and his associates’ rates are $300.00 per hour, based upon the number of hours they will spend on your case you get a far better deal by hiring them on a contingency. In addition, the costs required to engage in litigation are thousands of dollars if not ten thousand dollars or more. We advance the costs. You do not have to make a 401k withdrawal in order to fund your case The Employment Lawyers Group takes all cases on a contingency. If the employer is liable for your attorney fees we will assert our legal fees should be reimbursed at hourly rates of attorneys with our experience. While we might be worth more, it is not our goal to greedily assert our worth before a judge. Please allow us to review your high end employment problems. We have appellate and trial experience. You can read about our trials and appeals elsewhere on this website. Karl Gerber is used to deposing and cross-examining the highest level employees, agents, and officers of the largest employers in California. We have represented attorneys, corporate officers, doctors at all levels, executives, financial professionals, managers, professionals and sales people earning more than $1,000,000 a year. For executive quality representation no matter your level of employment, contact our sophisticated and established employment law firm at 1-877-525-0700. We have been the sole tenant in our Sherman Oaks building since Karl Gerber acquired it in 1999. Although that location is ideal for serving executives in Sherman Oaks, Encino, Tarzana, Woodland Hills, and entertainment professionals in Studio City, it is only a few miles from Beverly Hills, Westwood and the Westside. In Ventura County, in 2013 we acquired a waterside office in the Mandalay Bay marina area of Oxnard. Agoura, Westlake, and Thousand Oaks executives can chose between our Sherman Oaks and Oxnard locations. If you are a South Bay executive living in one of the beach communities we maintain an office in Gardena. Pasadena area clients can chose between our Sherman Oaks office or our downtown Los Angeles office. Call 1-877-525-0700 for an established employment law firm and speak to one of our seasoned labor lawyers. Employment Lawyers Group, Representing Employees Since 1993. Offices in Bakersfield, downtown Los Angeles, Gardena, Oxnard, Riverside, Sacramento, San Diego, San Francisco, San Jose, Sherman Oaks, Boston, and Tustin.